Since the beginning of the AIDS epidemic, an estimated 75 million people have been infected with HIV. Only one person, Timothy Ray Brown, has ever been cured of infection. Brown was diagnosed with HIV while living in Berlin in 1995, and was treated with anti-retroviral drugs for more than ten years. In 2007 he was diagnosed with acute myeloid leukemia. When the disease did not respond to chemotherapy, Brown underwent stem cell transplantation, which involves treatment with cytotoxic drugs and whole-body irradiation to destroy leukemic and immune cells, followed by administration of donor stem cells to restore the immune system. When his leukemia relapsed, Brown was subjected to a second stem cell transplant. 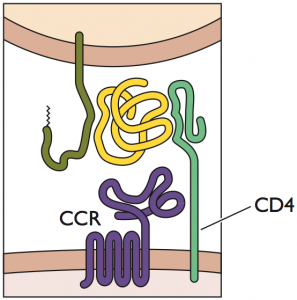 The entry of HIV-1 into lymphocytes requires two cellular proteins, the receptor CD4, and a co-receptor, either CXCR4 or CCR5. Individuals who carry a mutation in the gene encoding CCR5, called delta 32, are resistant to HIV-1 infection. This information prompted Brown’s Berlin physician to screen 62 individuals to identify a stem cell donor who carried a homozygous CCR5∆32 mutation. Peripheral blood stem cells from the same donor were used for both transplants. Despite enduring complications and undergoing two transplants, Brown’s treatment was a success: he was cured both of his leukemia and HIV infection. Even though he had stopped taking antiviral drugs, there was no evidence of the virus in his blood following his treatment, and his immune system gradually recovered. Follow-up studies in 2011, including biopsies from his brain, intestine, and other organs, showed no signs of HIV RNA or DNA, and also provided evidence for the replacement of long-lived host tissue cells with donor-derived cells. Today Brown remains HIV-1 free. Although Brown’s cure is somewhat of a medical miracle, and by no means a practical road map for treating AIDS, the example of the Berlin patient has galvanized research efforts and continues to inspire hope that a simpler and more general cure for infection may someday be achieved. Clinical trials have been conducted to test a variety of strategies in which CD4+ T or stem cells are obtained from a patient, the CCR5 gene is either mutated or its translation blocked by RNA interference, and then the resulting virus-resistant cells are returned to the patient. In one case zinc finger nucleases were used to delete the CCR5 gene in a patient’s cells, a procedure that we discussed in TWiV #278.